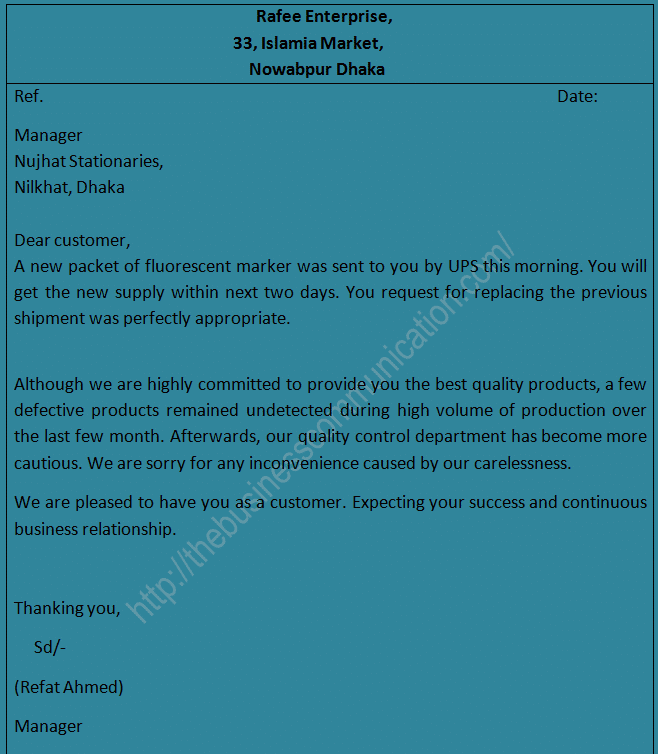 Specimen 1: of Adjustment Grant letter-01: Rafee Enterprise, 33, Islamia Market, Nowabpur Dhaka, wholl seller of fluorescent marker, has received a claim letter from Nujhat Stationaries, Nilkhet, dhaka for replacing one packet of marker. Write an adjustment grant letter informing the customer that he will get the new supply within next two days. Dissatisfied customers write complaint and claim letters either to the seller of goods or to the transportation authority, while the recipient of complaint and claim letters writes adjustment letter. A customer writes complaint letter if he finds anything unsatisfactory with the product he purchased. In the complaint letter, the customer simply expresses his cause of dissatisfaction. But, the customer writes a claim letter if he suffers from any financial loss. In the claim letter, the customer makes specific claim along with his logical cause behind the claim. After receiving the claim letter from affected customer, the seller will write the adjustment letter either granting or rejecting the claim. In both the cases, letter should be written in a friendly and wormy tone.